Hold onto your festive hats, Brisbane, because party season is about to hit full swing and there’s a new digs on Grey Street kicking things off and opening their doors to Brisbane’s biggest summer-long house party this December 1st. South Bank’s newest pub, Little Big House, is all wrapped up and ready to be gifted to Brisbane by chef Matt Moran and the Solotel group (of Aria and Riverbar fame) the revamped Collins Place Queenslander is bringing some colour to Grey Street this summer, with its casual party atmosphere and tropical décor. Little Big House is like the physical embodiment of that one mate you know that always throw the best parties – its opening hours of early to late, seven days a week (aka all the time) ensures that the fun never stops, and the drinks flow all night long. AND they’re there to pick you up in the morning, serving up Single O coffee and over-the-counter and takeaway breakfast from 7am daily. Can we hear a ‘real MVP’? If that wasn’t enough, their extensive drinks menu is also throwing down some seriously good vibes, with wines and ales coming in both little and big sizes (for all the Goldilocks out there), not to mention the super quirky Cocktails in a Can. Colourfully dressed for success in ways that only aluminium can, look out for the ‘Feels like Apple Pie’ and ‘Grape Expectations’ cocktails, who zesty flavours are the definition of ‘Drink Me!’ As for ‘Eat Me’ options, there’s a lot to offer. As every Aussie knows, the best parties aren’t complete without great food, and Little Big House’s scrumptious roast chicken is rumoured to be some of the best in the biz. 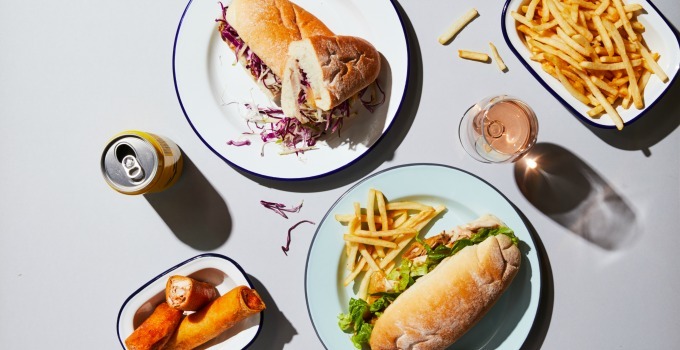 Keeping with its relaxed yet unique party vibe is Little Big House’s most surprising menu item, the chicken parmie spring roll (we kid you not). Wonderfully weird, and all the better for it, rest assured that this foodie must-try will have you falling in love at first bite. Three bears or not, this summer house party is never too big, it’s never too small, we think you’ll find it’s just right.